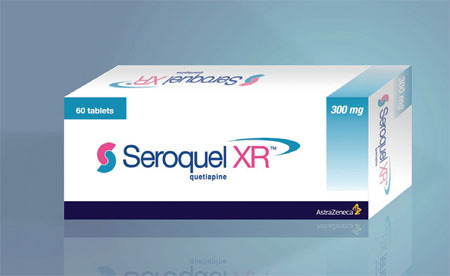 Seroquel is used to treat the symptoms of several different psychotic conditions. Schizophrenia, manic depression, and bipolar disorder can be treated with this medication in adults and in children who are at least 10 years old. Seroquel is not to be used in psychotic conditions that are related to dementia. Sudden death, pneumonia, or heart failure can occur in older adults with dementia-related conditions, if they take this medication. Other conditions to discuss with a physician before taking Seroquel include liver or kidney disease, a history of heart attack or stroke, seizures or epilepsy, liver or kidney disease, thyroid disorders, a history of low white blood cell counts, high cholesterol or triglycerides, trouble swallowing, or a personal or family history of diabetes. Always take this medicine exactly as it is prescribed. A patient's doctor will increase or decrease the dosage to ensure that the patient sees the best results from Seroquel. It's recommended that Seroquel be taken with a full glass of water. For patients who are prescribed the extended-release tablet, it's important to avoid chewing, crushing, or breaking the tablet. Seek emergency treatment if any signs of an allergic reaction are observed after taking Seroquel. For a patient who experiences an allergic reaction, symptoms can include difficulty breathing, hives, or swelling of the face, lips, throat, or tongue. Common side effects associated with Seroquel can include dry mouth, runny nose, sore throat, dizziness, drowsiness, weakness, nausea, vomiting, stomach pain, constipation, blurred vision, headache, anxiety, agitation, breast swelling or discharge, weight gain, or missed menstrual periods. Patients should inform a physician immediately if one experiences worsening or new symptoms such as a panic attacks, trouble sleeping, mood or behavior changes, or anxiety. Patients should notify a doctor if they start to feel impulsive, hostile, aggressive, restless, irritable, agitated, hyperactive, more depressed, or if patients have any thoughts regarding suicide or of hurting themselves. During the first 12 weeks of treatment, the patient's family or caregivers should be alert to any mood changes in the individual who is taking Seroquel. When first taking an antidepressant, suicidal thoughts can occur, especially in patients who are younger than 24 years old. Patients should tell a doctor immediately if these thoughts are experienced or if depression gets worse instead of better. Seroquel is classified as a FDA category C medication for pregnant patients. It is unknown if it is harmful to an unborn baby. Patients should talk to a physician if they are pregnant or planning to become pregnant during the course of treatment. Breastfeeding mothers should also consult a doctor before taking Seroquel.